Stay tuned for upcoming events for International Pediatric Summit in near future. On behalf of the Organizing Committee, we are delighted to welcome all the delegates to Dubai, United Arab Emirates, for the Annual International Pediatric Summit 2019 that will take place on the 14th - 16th of February 2019. IPS is a platform for medical professionals to exchange ideas, discover innovative opportunities, network, and expand their horizons. The conference will be held at the hilton Hotel which is a remarkable landmark located in the heart of the city. Participation at IPS 2019 will give you many excellent opportunities to share views on updates in pediatric medicine, and to have personalized feedback from world leaders in their respective subjects. It will broadly cover all disciplines of General Pediatric Medicine from essential research to application, focusing on global interactions and collaborations. The Summits’ agenda is split into two key feature programs: 1) the core program which consists of lectures conducted by world renowned speakers followed by an extensive discussion and 2) topical workshops that cover a wide variety of pediatric fields from international and key regional figures. This exciting and unique program was created to enhance and enrich your experience. Our world renowned guest speakers will share their insights and experiences on a broad range of pediatric lectures which are topical to clinicians. The Scientific Committee has created an exciting program that is tailor made to key areas including pediatric nutrition, pulmonology and allergy, neurology, nephrology and metabolic diseases which are valuable for all medical professionals including pediatricians, primary care physicians, family physicians, pharmacists, nurses and under allied health professionals. We hope that you will enjoy the Summit and that your interactions with your colleagues from all over the globe will stimulate a creative exchange of ideas and will be personally rewarding. All of the members of the local Organizing Committee wish you a revitalizing conference experience, an invigorating social event, and a memorable stay in the sensational city of Dubai! 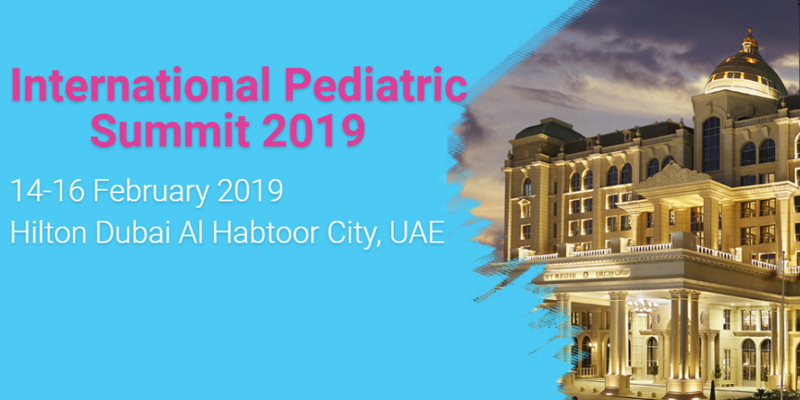 We look forward to welcoming you to the International Pediatric Summit 2019. IPS is a platform for medical professionals to exchange ideas, discover innovative opportunities, network, and expand their horizons. The conference will be held at the hilton Hotel which is a remarkable landmark located in the heart of the city. Best Viewed at 1024 x 768 pixels and above. This Page loaded in 0.08903 seconds on Fri, Apr 19, 2019 (07:11).